Introducing world's first high performance/ high mileage sports car. New car hits 92 mpg US. FuelVapor Technologies has developed one of the highest mileage cars in North America. 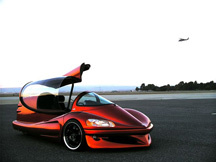 Created by inventor George Parker, this new concept car - the “alé” (alay) - has been in development for 15 years. The first prototypes are now complete and the results are outstanding. Plans are for limited production ale's to begin fabrication in 2008. FuelVapor Technologies will also be competing in the "Automotive X-Prize" - a $10 million competition for the fastest 100mpg car in the world. What would be better for every car lover then tuning their car up. Seeking high performance tires? Find tires online or customized chrome wheels and Exterior accessories, Performance Parts and Interior upgrades should be more then enough to build up your dream car. In todays climate of 'save our climate' Energy users and manufacturers of energy using products realise that to keep their business sustainable they will need to access improved technologies to improve the efficiency of their own product and to advance their skills and products in a ever demanding consumer world who wants convenienve and sustainability. With the potential for continued high energy prices, those companies that invested in their energy infrastructure-in the face of common corporate wisdom-may be positioned to reap a unexpected, but well-deserved, competitive benefit. Fuel vapor technologies is one such tecnology. Techology is an expanding thing in the world today. Such as Satnav aka Satellite Navigation, navigate yourself with this nifty gadget that way you will always know where you are and where you are going. High projected energy prices should encourage everyone with a stake in managing energy costs to re-examine their energy practices and technology investments. ©2006 FuelVapor Technologies. Site design by Prima Design. Last update Apr 26, 2007.